Yesterday a very dear friend of mine came to visit from Albany. Sara and her little boy Evan (pictured above) came and we had a lovely lunch together then we wandered around downtown. Now, I haven’t seen Evan in a few months and now with the mark of being about 15 months old, he is in to everything. He is also growing taller and taller each day and his eyes get wider with each new experience. I met them at the church where he had been exploring and especially loved running up and down then ramp. Then we started to walk downtown and the world was like new to this little boy. As he toddled along, he said hi to everyone who walked by and even the pole was super interesting. Inside the restaurant, we sat by a window which meant Evan had plenty to watch and explore. He talked to me a bit, he waved at everyone, and had a good time with the coaster. Sara and I also had a great lunch catching up, telling stories, and being quite amused by her child. When it was time to leave, Evan decided he wanted to open the door. Then as we walked around downtown everything he saw, he saw with wonder. The world was a great place to explore and learn about. He rung every bell, wanted to touch every surface, said hello to many people…even in one store he found a pull light that he turned on and off pretty constantly. While Sara tried to steer him, I was quite amused and really refreshed by his outlook. 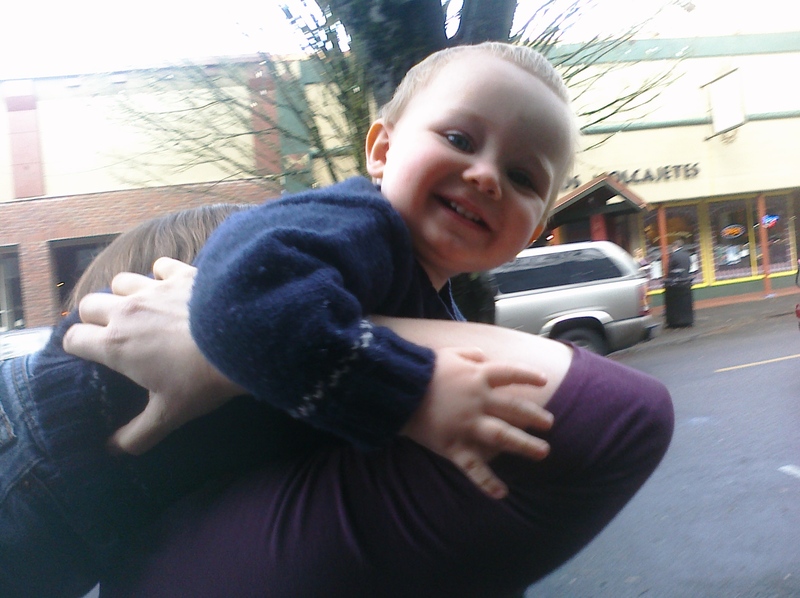 Even is a smiley kid (as you can tell from the picture) and loves life while he is so taken with wonder. Sometimes I forget how much wonder there really is during this season. While we are running around, trying to make the season perfect, there is other stuff going on. The world is about to be new and so we, in expecation, could be able to see how wonder filled things actually are. In 1 Samuel, Hannah knows the power of God and sings out her wonder. Hannah’s song is a good reminder this morning just how much we can be in love with God. She knows the wonder that is to come and sings out glory, honor, and love. She sings out because she yearns for a little one. She sings out because she yearns for a better world. And in wonder, she lifts up her mighty prayer. O God, may we see the wonder in this day much like a 15 month old sees wonder in every moment. May we open our eyes and our mouths to lift up a song to you. Amen.